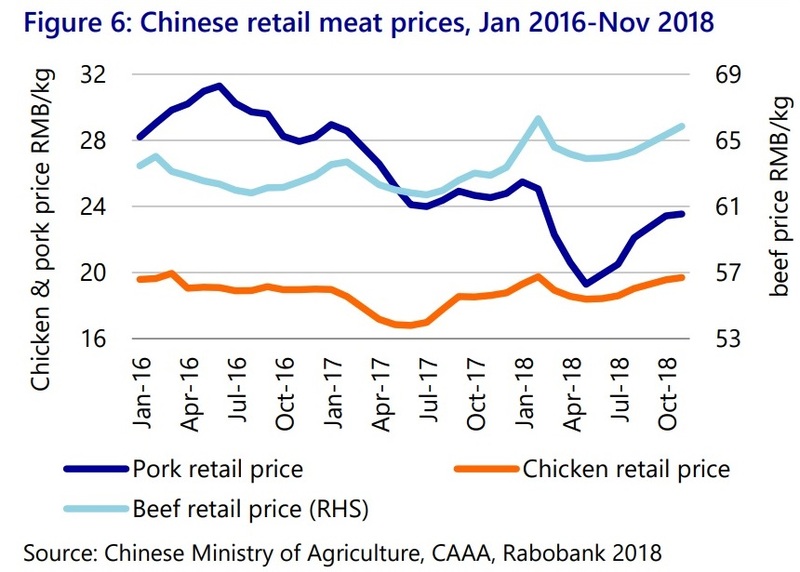 THE Chinese beef market continues to perform strongly, with prices at their highest point in the past three years, and close to 15-year highs, as a result of growing demand for red meat and impacts caused by the spread of African Swine Fever in the country’s pig population. The tight supply relative to steadily growing demand is the major cause for the strong price, Rabobank suggests in its latest Beef Quarterly review. 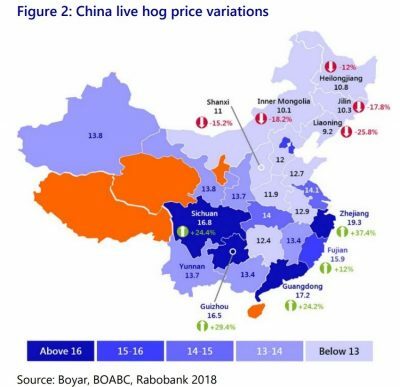 African Swine Fever was another factor (see further commentary below), as some Chinese consumers have reduced pork consumption over food safety concerns and increased their consumption of other proteins, Rabo’s report says. China’s Statistics Bureau has released agricultural data of the first three quarters of 2018, with domestic beef production increasing by 0.6 percent year-on-year, while the country’s beef cattle inventory decreased by 0.2pc year-on-year, creating an expectation of lower domestic production in the coming year. “Driven by high prices, beef farmers tend to shorten the fattening time, causing average carcase weights to decline,” Rabo said. In the first nine months of 2018, China’s official beef imports increased by 40pc year-on-year, reaching 456,000 tonnes. Strong domestic demand and tight local supply are believed to be driving up imports. The decline in grey channel trade as a result of stricter inspections on the borders may also be a factor, Rabo said. Entering 2018, China granted access to a number of European beef exporting countries, including Ireland, the Netherlands, Denmark, France and the UK, to export frozen beef to China. “French beef was heavily promoted at the recent China International Import Expo, indicating an ambition to enter China’s market,” Rabo said. The Expo also highlighted the increasingly important role played by e-commerce. During the Expo, JBS and Win-Chain, Alibaba Group’s global sourcing company, signed an A$2.1 billion meat supply deal for the coming three years. A portion of the imports is believed to be directly targeted to online shopping, with the rest competing in the B2B market, leveraged by comprehensive services including cold chain logistics and supply chain management provided by e-commerce players. 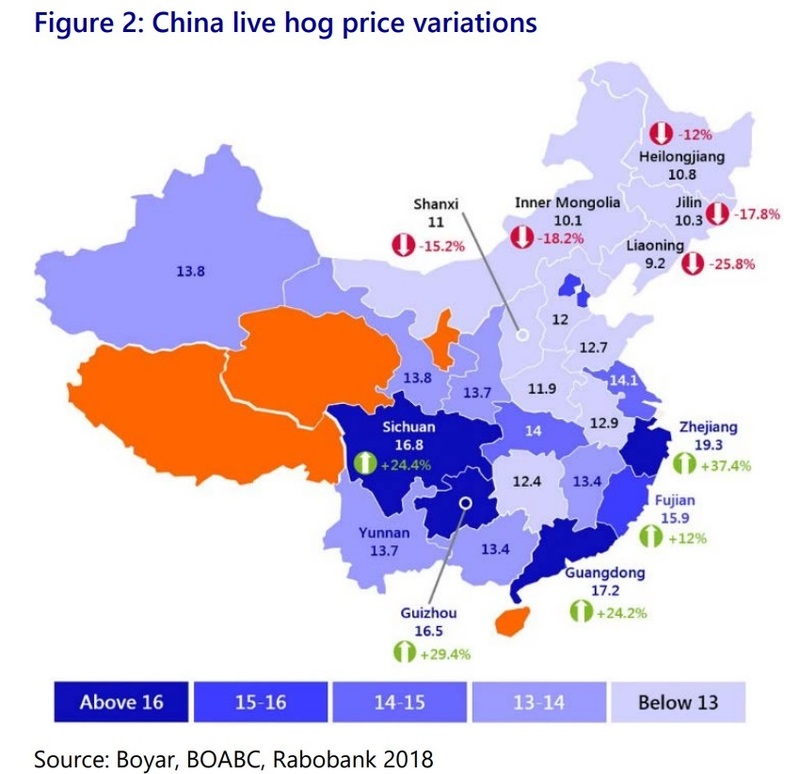 The continued spread of African Swine Fever (ASF) across China is resulting in increased slaughter, transport bans and volatile prices, Rabo’s quarterly beef report says. A decline in China’s pork production is clear. As of 19 November, there were more than 60 confirmed cases scattered across all of the country’s major pork-producing provinces. Most cases are in small-sized farms, but several were from larger-scale farms (see map below). “Given the sheer size of production and the fragmented structure, it will be a great challenge for China to control the disease spreading in the coming year,” Rabo’s report said. On 12 September, Chinese authorities banned the transport of live hogs in provinces with reported ASF outbreaks, and in the neighbouring provinces. As a consequence, huge regional price differences opened up between hog surplus and deficit regions. In addition, pork demand is softening. Specific markets, such as group dining, are believed to have lowered pork consumption over food safety concerns. Rabo has developed three scenarios to consider potential future impacts of ASF on Chinese pork production. They include drops in production by 2-4pc (1m-2.1m tonnes), 6-8pc (3.1m-4.2m tonnes), and 10- 15pc (5.3m-7.9m tonnes), depending on how China’s policy evolves. Pork consumption is also expected to drop in each scenario, but not by as much as production. Lower consumption reflects surging prices, supply shortages and consumers’ food safety considerations. In each of Rabo’s scenarios, existing exporters – the EU, Canada, and Brazil – are expected to supply more pork meat to China in 2019. But how much more depends on respective domestic supply and price competitiveness in the global market. In 2019, the EU could mobilise more than two million tonnes, including pork offal, to supply China. But this will come at the expense of exports to other markets, provided prices of shipments to China are attractive. Brazilian pork exports to China increased by 247pc in the first ten months of 2018 to 132,900t, due to ample supply following the closure of trade with Russia. Pork production in Brazil could rise 4-5pc in 2019, meaning Brazil could be able to increase exports to China by a further 60pc in 2019 to 256,000t, Rabo said. China is also likely to turn to the US for more pork imports, if the price in other regions rises to overcome price and tariff differences. Since the first reported ASF outbreak in China, US markets have gradually adjusted to reflect the upside trade potential, despite great uncertainty. In Europe, ASF remains widespread in the east. The ‘open’ borders with Ukraine and Belarus made it extremely difficult to eradicate in this region, Rabo’s report said. The Belgian outbreak has been controlled, with all cases being contained in the restricted zone. So far, the impact remains limited for Europe, as the infected countries are not key producers or key exporters. 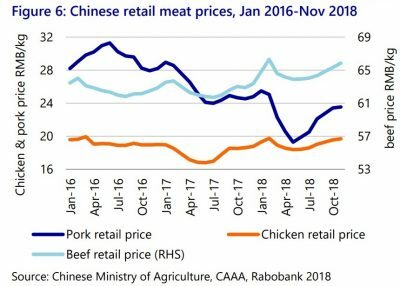 A drop in pork consumption in China will give rise to increases in other animal proteins, including eggs, poultry, beef, mutton and seafood, Rabo’s quarterly beef report said. “Poultry will probably benefit the most. This is because poultry is already the major substitute for pork, particularly in meat processing and catering, and also because poultry is widely accepted by all the consumer groups in China,” it said. “With beef production in China stagnant for a couple of years, increased beef consumption will require the share of beef imports to rise year-on-year,” the report said. As outlined above, in the first nine months of 2018, China’s official imports of beef increased by 40pc year-on-year. Rabobank’s report said it expects to see this strong growth continue in 2019. “All the major exporters, including South American countries, Australia, New Zealand and some European countries, will benefit from China’s stronger demand in 2019,” it said. 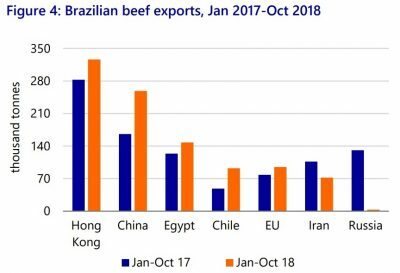 Brazilian beef exports have increased by 10pc during the first ten months of 2018, with trade into China growing by 56pc, year-to date, compared with 2017.